It’s written for Python 3 but can be easily adapted to earlier versions by modifying the print statements accordingly. Input is taken from stdin, the result is written to stdout. Austrian SEO Oliver Hauser has blogged about a problem with the SEO Quake toolbar (article written in German) on Firefox 18 which was not existing in prior versions of Firefox. He noticed that some of the buttons he added to the toolbar, such as those that link to the Sistrix toolbox, no longer worked after upgrading to version 18 of FF. But this problem is not limited to buttons he added to the toolbar, some of the default buttons like the Twitter and Facebook buttons also do not work. They simply do nothing. He raised the issue with the SEOQuake team but they said they couldn’t reproduce the issue. This made me think that it could be a problem with non-English systems / browsers. So I fired up a fresh VM with Xubuntu I had recently installed and added the SEUQuake add-on to Firefox – which was still at version 16 at that time. Sure enough everything worked as expected – until I upgraded Firefox to version 18. So I am facing the same issue as Oliver on an English install of Ubuntu and Firefox 18. Did anyone else notice this issue? Or even better, has a solution? Thank you for using Seoquake. Unfortunately, at the present moment we have temporary problems with Seoquake version for Mozilla Firefox 18.0. I apologize. It’s been brought up to our developers and they’re in the process of fixing it. Meantime, I’d like to advice you to use either earlier version of FF or Google Chrome. So I guess chances are good that a fix will be available soon. Tools for the command line seem to be a relict of the past. Who wants to deal with various commands having cumbersome options and syntax when you can acheive the same using a specialized tool with an elegant GUI? Or maybe even Excel. They are available for most platforms. No need to learn a different set when switching from one operating system to another. Each of them is quite specialized but they can be easily combined to perform relatively complex tasks. UPDATE: Now also including an Image Search infographic. 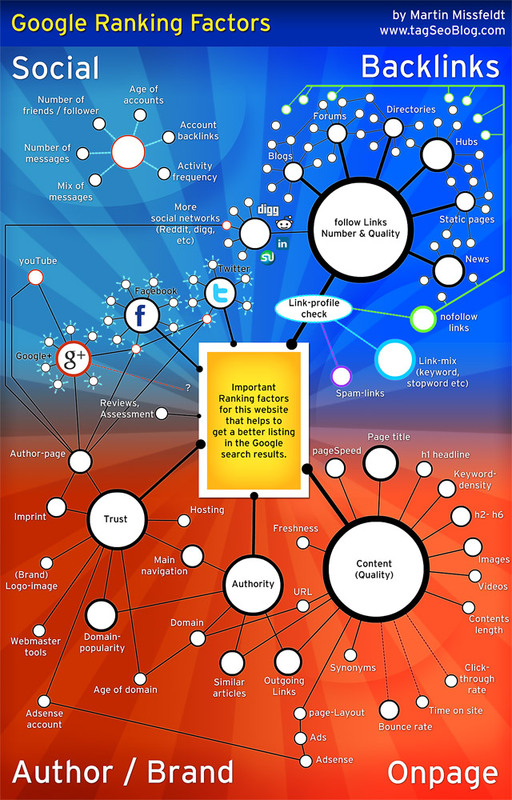 Martin Missfeldt has created a fantastic infographic depicting Google’s ranking factors as he currently sees them. Click on the graphic to get to Martin’s original blog post where you can download a bigger version of the infographic for printing and pinning it on your wall. As Python is not really my mother tongue I decided to create a Java 6 version of the download tool for the search data in Google’s Webmaster Tools. Using the -m or –lastmonth command line option the tool will only export the data for the last calendar month. I use this switch in my cronjob which is scheduled to run every month on the 5th day of the month. The files will be downloaded to the directory you defined in the properties file. By default it will download all types of search query data. If you want to reduce the amount of files being downloaded, change the list of download types in DownloadFiles.java and recompile. I tested it on Ubuntu 11.10 and Windows 7. Today, Google has published some Python scripts which allow an automated download of data from the Google Webmaster Tools, namely the Search Query data. UPDATE: I created a Java version of the Search Query downloader. Any feedback would be great. The two examples included provide a simple script to download search query data for the last month into a CSV file and another to create a Google Docs spreadsheet containing that data. Curious as I am, I had to read that article by Adam Singer. In essence, the author complains about Facebook because they are trying him to force an app just to see an article on the Guardian. Google recently announced a new way to tag content on multilingual / multi-regional web sites using the hreflang attribute in a rel=”alternate” link tag. A classic example for this would be Spanish language content for the US, Mexico and Spain. Assuming each of these geographical regions would have a separate site we might have similar content on www.brand.com/es/, www.brand.mx and www.brand.es. Ideally, a Spanish speaking searcher in Spain would see search results only from www.brand.es while someone in Mexico should see results from www.brand.mx. In reality the SERPs will contain a mix of results from both if not all three sites. One way to show only one of these results in the results is the use of the canonical tag, so in our example we could define the version on www.brand.es to be the one and only version so this will be the only one of our Spanish-language sites showing up in the SERPs while simultaneously collecting all the link juice. Late last night (CET), I was informed by SEOMoz that they published my recent guest post about Google Chrome not sending referrer data from Google Plus. As it turned out, the lost referral data was caused by a change to Google Chrome to enforce the use of SSL encryption on Google+. A “referrer” meta tag? And look! It’s spelled correctly! This is amazing, but what does it do?